KitMonsters – The Sound of Arrows. The music makers’ guide to making music. 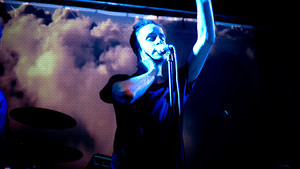 Electronica act The Sound Of Arrows make the kind of filmic music that has plenty of people knocking at their door. Two Swedes, Oskar Gullstrand and Stefan Storm, make up the band behind Into The Clouds which was of the most downloaded songs in the UK a couple of years ago. You might also have caught M.A.G.I.C. 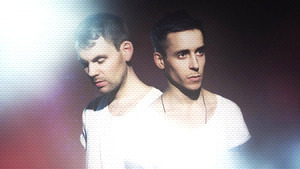 another slice of their lovely, dreamy synth-pop, in a Mitsubishi ad, or heard some of the remixes they’ve done for Lady Gaga or Nicole Sherzinger. Their debut album is Voyage, and they won an award for their beautiful music video for M.A.G.I.C. .
We grabbed the chance for a chat with them shortly before they performed with Visitors and Fear Of Tigers at an experimental mash-up at 93 Feet East in London, and found out all about buying synths online, breaking synths on stage and the importance of finding the perfect sound. Touring is a great opportunity for them to indulge in their passion for buying synths, and they get into some weird and funny situations, almost like blind dating! The gigs we’ve been doing so far have been a lot about concentrating on the songs, but people who come to our gigs in the future hopefully will have heard our album we’ll be able to experiment a bit more and do weirder renditions of songs but sometimes with an act you don’t really know, you want a trip down just what they’re about and just good presentation of the songs. Ah yes, those songs: glorious shimmery, swirling things that seem to come from somewhere else altogether. That was our aim really, to make a filmic, dreamy pop album that’s just sort of constantly swirling, there’s just movement. It’s not a very compressed album, if you look at the waveform and compare it to other pop albums of today it’s very dynamic, it grows and flows and that’s what we wanted to achieve. We wanted people, when they listen to our music, to this album at least, to be transported to another world, which sounds a bit pretentious but that was the idea, that was the goal, that was what we set out to do with these kind of filmic scenes and filmic vibes, you want people to look at the booklet and then imagine this world when they listen to it. Of course, there was an actual film made to accompany M.A.G.I.C, which won Best International Music Video at the Musiclip Festival last year. The video has had 1.5 million views and tells a poignant story. It features two children waking up in their environment, their normal environment but all their parents and everyone else in the world has gone. And they encounter mystical beings. But it just dawned on me the other day it’s kind of funny that we’ve got four music videos and in our world, and in the music videos, either it’s just us or there’s kids. Stefan says that roughly 90% of the album involved analog synths, and they hunt down rarities. We’ve spent almost every dime we’ve ever made on the band, every tour we’ve done we’ve just invested in new synths, so it’s an ever-growing collection. It includes a Minimoog, a Korg MS-20, a Juno-60 and a Juno-6, an Omnichord, a Roland SH-1000. There’s also an Elektron Sid Station, though that is coming into its own on the newer material. Their most recent video for Wonders is another visual feast. To be fair some of our synths like the Juno and a couple of other things, you could probably recreate what we’ve done with them digitally. But there are some synths that are just irreplaceable, like the Yamaha SK20 which is absolutely my favourite. It’s the synth we’ve used the most and that has such a unique sound, there’s something about it, you cannot get that sound with a computer. The Arrows’ inspirations are a fascinating mix, from rap to Britpop, especially Damon Albarn’s work. Not forgetting some of the synth greats like Vangelis. Stefan covets his monster Yamaha CS-80 synth! And Stefan has some words of encouragement for anyone starting out in music - sampling is the way to go. The band joke around about how they are going to approach the next album, but one thing’s for sure, it’ll have a new vibe, and they may produce for other people too. We’re such big fans of music in general, very big music consumers. You want to be able to do a lot of different kinds of music. And now we’ve done this sort of album and actually I really want to do an R&B type of thing. Not for us but maybe produced for someone else. Because we’ve done four to the floor now, a lot, and it’s a lot of dance beats but I kind of wanna groove a bit more for whatever we do next. Stefan is a man with a passion for synths, particularly vintage ones. Ever since we formed as a band we’ve constantly learned more about synths, we’ve bought a lot more gear and that sort of thing and always wanted to develop and make it better, we’re total perfectionists so it took us a while before we reached a point where we felt happy with our sound. I wasn’t happy in the beginning when we had the band, it was just a band, it was a little project we had on the side as a hobby. But then when we found this dreamy filmic kind of sound it felt as though we’d tapped into something that felt somewhat unique. I mean you know where all the influences come from but as a whole it felt like we were entitled to exist and that took a while to reach and it’s mostly thanks to the synths. We started out as a guitar, ukelele and trumpet based band and we’ve moved on from that sound so there’s no guitars – well there might be one or two guitars on the album and one or two instances of piano but apart from that it’s all very much just analogue synths and that’s mainly what we played on the album. He explains that roughly 90% of the album involved analog synths, and they hunt down rarities. Stefan is clearly in his element comparing synths, and has lots to say about analog versus digital. Having said that I think it’s a bit of a nerdy thing, well obviously it’s quite nerdy but when it comes to this thing about everything has to be analogue, a lot of it is just about the idea of a sound coming from a machine that actually exists. And that you’ve got knobs and that sort of thing. 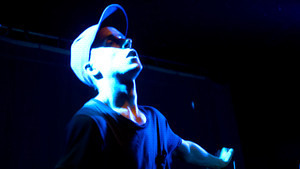 He also considers the computer-based synths capable of hampering creativity rather than helping it. If you do something on a computer there’s no real limit and that can sometimes be very limiting actually, to have limitless abilities to create whatever you want to create. 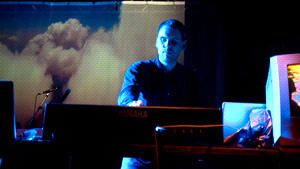 However, he has a practical approach to touring with vintage synths. We used to tour with our analogue synths but for one it was so expensive and two it was so straining for our backs to carry those things, they are so heavy. They were so expensive and they started to break, we’ve gone through a couple of the SK20s and, especially, it’s sad when something so old dies, it’s managed to survive for 35 years. Then it falls into the wrong hands. But now what we’ve done is to multi-sample our sounds which a lot of acts do when they fly, so we’ve got a MIDI keyboard which actually plays the analogue sounds because we recorded it in our studio, pressing down one key then pressing down the next key and just multi-sampling like that. Midi keyboards are no safer in the hands of The Sound Of Arrows though, apparently. 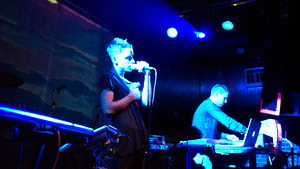 As well as recording and touring, The Sound Of Arrows are much in demand for remixing tracks for mainstream pop acts. A lot of people that listen to our remixes, especially the bigger pop things… Maybe I’m being detrimental, oh I shouldn’t say that, but the point being that they don’t really care about the sound. To me it was just an interesting idea to have a lot of analogue synths alongside Lady Gaga and Nicole Sherzinger’s voice. It feels like it’s quite far away from what they usually do. But I’ve been told that Lady Gaga’s stuff, a lot of it is the Jupiter 8, which to me is… I find it very weird, I can’t really hear that but I guess if you play it tight enough. I just thought it was all computer based. Some people might say they’re bringing a more organic sound to these acts. We just do whatever pleases us. It’s a good way of learning a new synth or just trying out weird stuff… For every remix we’ve done it’s some new thing we wanted to try and so it’s good for us. Though nowadays he’s so passionate about synths that he almost paid £13,000 for a Yamaha CS80, as made popular by Greek pop genius Vangelis before deciding that this was insane and as he put it, going too far, way into nerd territory. Stefan started his musical trajectory with the guitar. I inherited a guitar from my brother and I didn’t play synths until we started having our band, it was always guitar-based. I was obsessed by Britpop and that sort of thing, I played that kind of stuff. He is happy to claim Damon Albarn as one of his greatest inspirations, as well. Damon Albarn not so much for this album I guess. Maybe like a good sense of melody, that’s what Damon Albarn has. But he’s always been my one hero more or less. I love Blur, I love Gorillaz, I love his soundtracks, I love The Good The Bad & The Queen. Didn’t really care for the opera but I still bought the album. Everything is keyboards on the album so I play keyboards on the album and do a lot of the effects sounds and stuff like that. And that’s also mostly what I do, is layering the effects and stuff on top. His first instrument, however, was the trumpet. My father didn’t force it on me but he played the trombone and he really wanted me to play the trumpet, so I started. I played the trumpet for seven years and I played mostly jazz I think, big bands and stuff like that. However, when it came to playing the trumpet with The Sound Of Arrows, it didn’t really work out, though the band threaten that the next album is going to be a hip hop extravaganza on which Oskar not only plays the trumpet but raps as well. Oskar’s musical taste is varied. Yeah, Stefan’s my biggest inspiration. I listened to a lot more electronic music, I think. I used to listen to everything that came from Warp and Ninja Tune. I’m a really big fan, I listen a lot to Squarepusher and Aphex Twin, DJ Shadow and stuff like that, sample-based electronic music. And then when I met Stefan I started listening more to pop music. Stefan also appears to have influenced him when it comes to the buying up of vintage instruments. We acquire these synths, a lot of it is online and since they’re quite heavy you don’t usually have them shipped. Or you can but that would be very expensive. So you try to buy things locally, so when we’ve been out on tour we go on Ebay at night at the hotel, and Ah, there’s a synth nearby here. That’s how we bought our Juno-60 near Glasgow, when we were playing there, we just went past a little suburban area, there was this guy who collected a lot of synths and he was quite a weird guy. It is always kind of weird when you buy things on line and then you decide on a meet-up spot. The last thing we bought was a (Yamaha) CS10 and I was waiting for this guy out in a really dodgy area. And it’s kind of weird when you’re waiting for someone, it’s like you’re on a blind date – could that be him? No, he’s carrying a bag, no that’s not him… and then you approach someone and it’s no, no sorry, waiting for someone else.